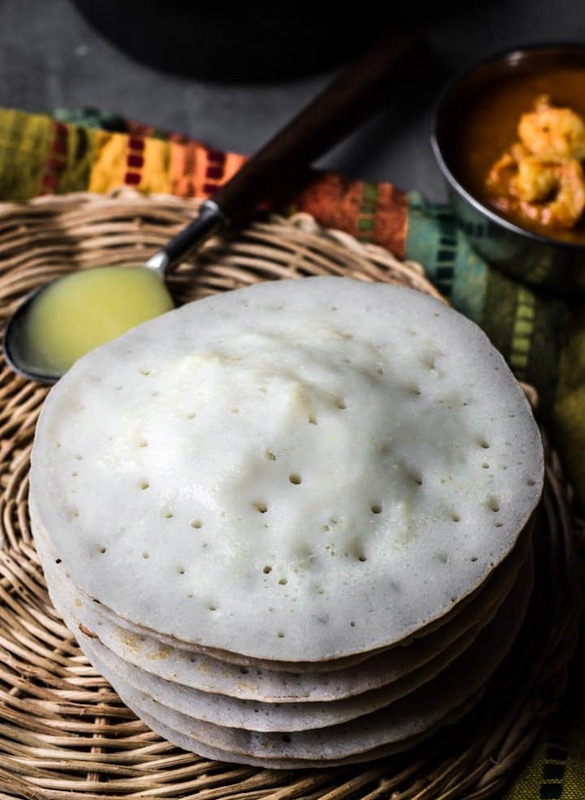 Kappa rutti or Kappa rotti – This soft in the center and crispy on the sides 4-ingredient dosa or pancake from Mangalore is a culinary delight. Try it out today – no fermentation required! What is kappa rutti or kappa rotti made of? Kappa rutti is a popular breakfast dish from Mangalore (a city in the southern part of India). 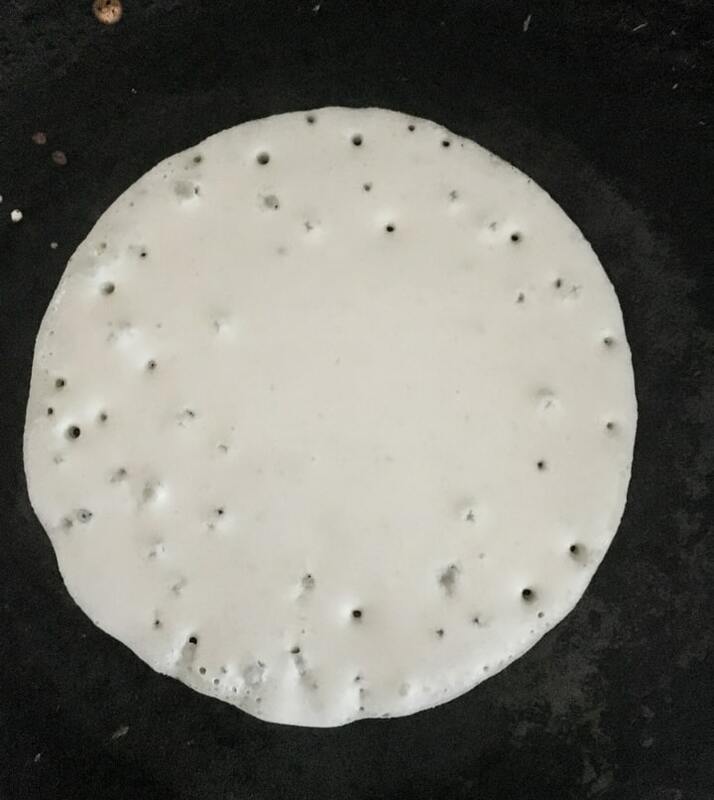 It is a type of dosa (pancake) made by grinding soaked rice with freshly grated coconut, flattened rice (poha), methi seeds and a tad bit of salt. 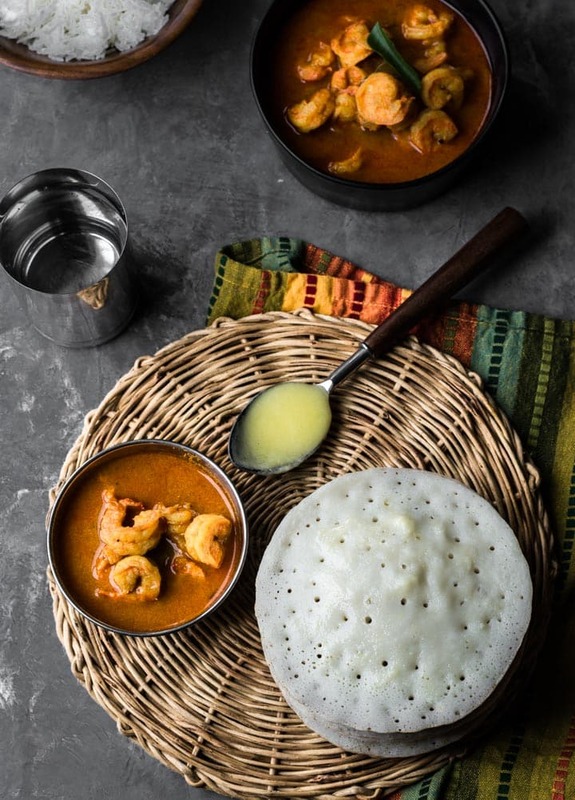 While you can pair it with any Mangalorean curry such as Kori Gassi (chicken curry), Yeti Gassi (shrimp/prawn curry), or Meen Gassi (Fish curry) but for kappa rutti lovers like me, a dollop of butter or ghee will suffice. 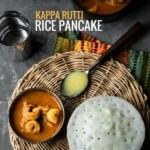 How to make kappa rutti? Traditionally kappa rutti is made using a clay tawa (frying pan) also called vodu (in Kannada and Tulu). Vodu are concave shaped frying pans that not only makes dosas more delicious but also offers a myriad of other benefits such as uniform cooking, nutrient retention and maintaining pH balance of the food to name a few. 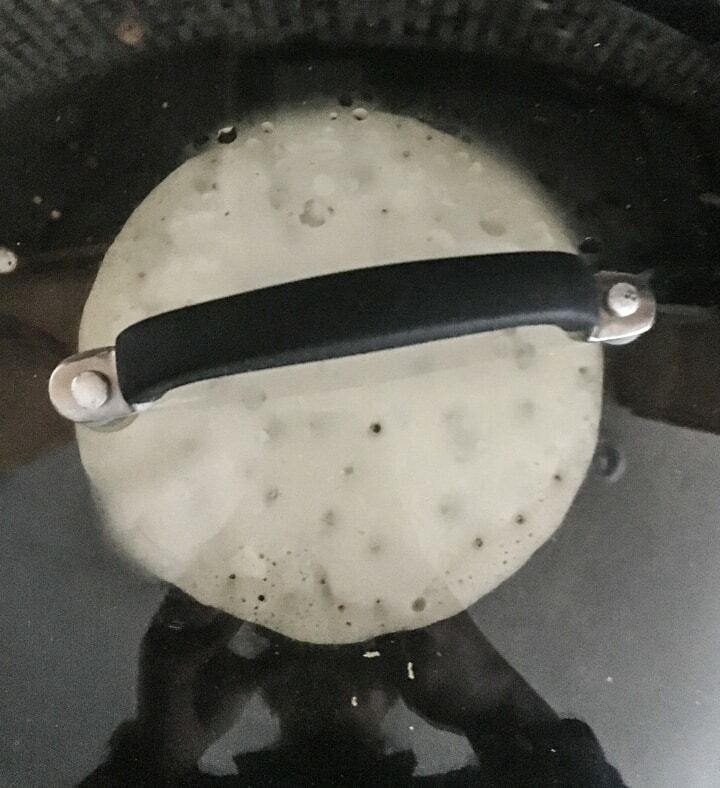 Don’t despair if you don’t have a clay tawa – a cast iron frying pan will work just fine! Soaking rice – Rinse the rice couple of times in water till the water runs clean. Soak the rice in 2 cups of water along with methi seeds for 5-6 hours or overnight. 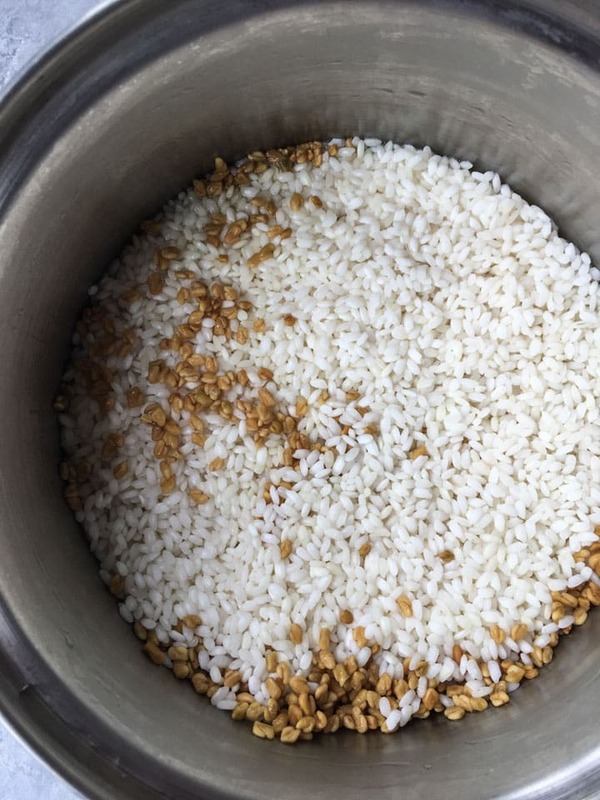 Grinding the batter – Drain the water from the rice. Grind the rice and methi seeds to a fine paste along with grated coconut, flattened rice and salt using as little water as possible. Once it is finely ground, add water as needed to get the consistency of dosa batter as shown in the video below. Making Kappa rotti – Heat a tava or a pan over medium-high heat and grease it with oil. Add a ladleful of batter in the center of the pan (do not spread). In a few seconds, you’ll notice bubbles forming and popping like in the picture below. Cover the pan with a lid and cook until done. DO NOT flip it to the other side – Kappa rotti should be cooked only on one side. Repeat till all the batter is used up. Serve hot with butter/ghee or your favorite curry! 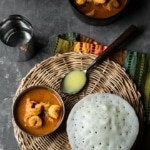 Craving more Mangalorean food? 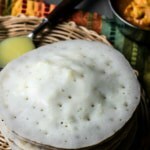 Check out all my Mangalorean food recipes here! ★ Did you make this recipe? Please give it a star rating by commenting below! 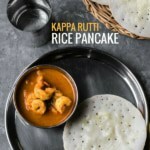 If you are in the mood to mix-up your breakfast routine, then you’ve got to check out this 4-ingredient dosa or pancake from Mangalore called Kappa rutti or Kappa rotti. It is soft in the center and crispy on the sides and is a culinary delight when paired with chutneys or leftover fish curry. Rinse the rice couple of times in water till the water runs clean. Soak the rice in 2 cups of water along with methi seeds overnight or for 5-6 hours. Drain the water from the rice. Grind the rice and methi seeds to a fine paste along with grated coconut, flattened rice and salt using as little water as possible [see note 1]. Add water to the batter to get the consistency of dosa batter as shown in the video here). Heat a tava or a pan over medium heat and grease it with oil. Add a ladleful of batter in the center of the pan (do not spread). In a few seconds, you'll notice bubbles forming and popping as shown in the step by step pictures. At this point, cover it with a lid and cook until done. Repeat till all the batter is used up. Serve hot with butter or your favorite curry immediately! This dosa batter does not require fermentation but for best results leave it at room temperature for a few hours before making kappa rutti. It will take you a few tries to get the consistency right. That's why always start with less water. If you are making kappa rutti for the first time follow these additional steps after step 2 - Transfer 2 ladlefuls of batter into a bowl and then add a few tablespoons of water till you get the consistency of a dosa batter. Make your first dosa, if bubbles are forming and popping you've got the consistency right. If the batter is too thick and does not form bubbles, add more water to get the consistency as shown in the video here. Kappa rutti can always be reheated but they are best eaten as soon as they are made. NOTE - I am not a registered dietitian or nutritionist. Nutritional information is provided a courtesy and can vary depending on the exact ingredients you use.